Outback adventurer, record-holding long-distance cyclist and pioneer motorist, Francis Edwin Birtles (1881-1941) crossed Australia dozens of times, taking many photographs, making movies with Frank Hurley and breaking many endurance records. On 21 September 1912 Birtles with his brother Clive and bulldog 'Wowser' left Melbourne in a blue 20hp Ford Flanders touring car to drive to Sydney, Brisbane, Charters Towers and then the Gulf of Carpentaria. 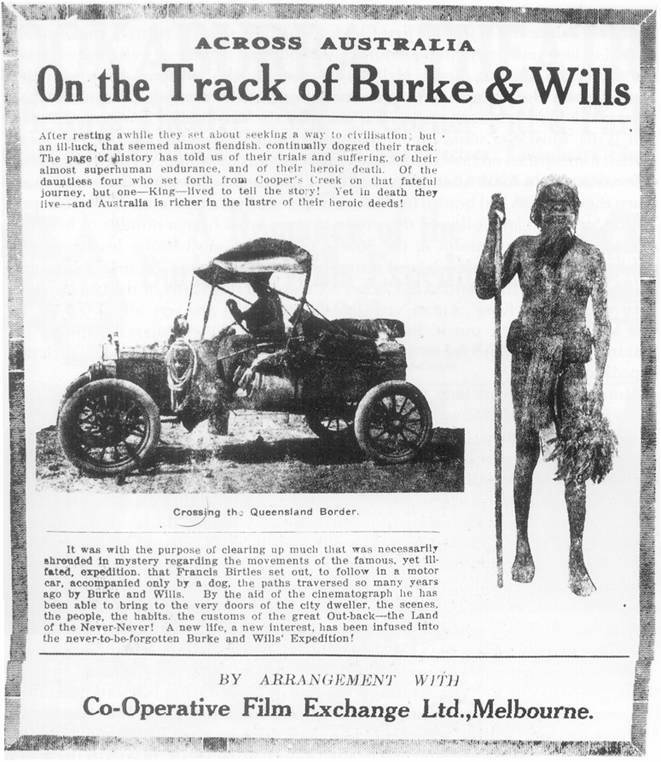 He suggested he might then go on to Port Darwin or returning to Melbourne via Burke and Wills' track, but from the Gulf he drove closer to the Northern territory border than Burke's track, and he arrived back in Melbourne in January 1913. On Saturday, 13 February 1915 he left Sydney for a six month long motoring tour following Burke and Wills' track. Unnacompanied this time, except for his bulldog, Birtles, he reached Broken Hill on 25 February and Adelaide on 1 March. He remained in Adelaide for two weeks to recover from an illness and then went via Burra, Port Augusta, Quorn and Maree to Cooper Creek. He reached Boulia in May, Gilliat in June and Normanton on Saturday, 5 June 1915. He then returned to Melbourne via Cape York, Einasleigh, Hughenden, Tambo, Roma, Toowoomba and Brisbane, arriving in Melbourne at the end of September 1915 having covered 7,000 miles in seven months. Birtles took a movie camera and made a cinematographic record of the journey. He then drove from Melbourne to Swan Hill and Menindee to finish the movie of the Burke and Wills' track. The film was called 'Across Australia: In the Tracks of Burke and Wills' and was released by The Co-Operative Film Exchange Ltd of Melbourne. It opened in Melbourne at Hoyt's Olympia Theatre on Christmas Day 1915. Thursday, 6 January 1916, page 6. Across Australia on the track of Burke and Wills is the title of a remarkable film included in the new programme screened at the Wondergraph, Hindley Street, and the open-air Pavilion, North-terrace, last evening. The film, which was secured by Francis Birties recently on his journey in a motor-car across Australia, throws new light on the wanderings of the intrepid explorers, and is of great educational value. Birtles had many exciting adventures, and these are vividly depicted. The film shows also the last of the Aborigines, fishing, gathering shellfish, grinding the nardoo seed, of which one reads in the account of the last days of Burke and Wills. Saturday, 8 January 1916, page 16. No better proof of the popularity of the programme of pictures screened at the Wondergraph Hindley-street, and the open-air pavilion North-terrace is needed than that provided by the attendance of large and enthusiastic audiences nightly. Across Australia on the Track of Burke and Wills is a remarkable film, secured recently by Francis Birtles on his long and perilous journey by motor car across Australia. His thrilling experiences, are vividly depicted. Birtles revisited Cooper Creek several times, including a visit to the Dig Tree in December 1928 with his dog Yowie. Birtles' photograph of the tree was published in several papers in 1933. Images of Birtles' motoring trips at the National Library of Australia. © National Library of Australia - www.nla.gov.au Clive Birtles at the wheel of the car with the dog, Wowser. © National Library of Australia - www.nla.gov.au Site of Burke and Wills most Northerly camp on the Byno River. © National Library of Australia - www.nla.gov.au Marked tree by Burke and Wills. © National Library of Australia - www.nla.gov.au The Oldsmobile 30 crossing Cooper's Creek near Burke and Wills depot. © National Library of Australia - www.nla.gov.au Car and tent at a campsite in the central Australian desert. © National Library of Australia - www.nla.gov.au Man [Francis Birtles?] trying to dig the car out of a bog on the Leichhardt River. © National Library of Australia - www.nla.gov.au Car parked outside a station homestead, Gulf of Carpentaria.